Jonae Fredericks started writing in 2007. She also has a background as a licensed cosmetologist and certified skin-care specialist. Jonae Fredericks is a certified paraeducator, presently working in the public education system. Wrapped around your windpipe on all three sides is a butterfly-shaped gland called the thyroid. This tiny gland has huge responsibilities such as controlling your body temperature, metabolism and the production of vital hormones. Iodized salt is one of the thyroid gland's strongest allies; without iodine, serious thyroid problems can develop. Your thyroid is the only part of your body that requires iodine. After you ingest iodized salt, the iodine enters your gastrointestinal tract. Then proteins transport the iodine to follicular cells within the thyroid gland, according to California State University. Inside the follicles, the iodine undergoes an oxidation process necessary for T3 triiodothyronine and T4 thyroxine hormone production. Your pituitary gland, a tiny gland located at the base of your brain, controls how much of these hormones your body needs, and your thyroid responds accordingly. If your daily diet lacks iodine, you can develop a condition known as iodine deficiency disorder or IDD, which is detrimental to your thyroid gland. This condition is rare in the United States because of the common use of iodized salt. The human body does not produce iodine, so if you do not receive iodine through iodized salt or some other means, your thyroid gland does not produce sufficient levels of thyroid hormone, according to the University of Washington. This condition, known as hypothyroidism, can cause weight gain, fatigue, depression, increased cholesterol levels and muscle cramps. Although the rate of iodine deficiency in the world is on the decline, at least 54 countries remain under threat of IDD. Pregnant women living in iodine-deficient areas face severe health risks, including stillbirth and spontaneous abortion. If their children are born, they face the risk of mental retardation and congenital malformations. 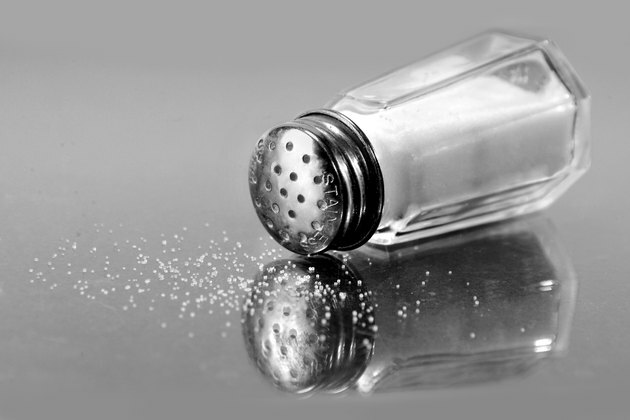 The World Health Organization is combating IDD with iodized salt. Low-cost and highly effective, the addition of iodized salt to the diet of those at risk provides the thyroid with the iodine it needs to function normally. Your thyroid only requires small amounts of iodine, approximately 150 mcg daily, to function properly. While iodized salt is an important supplier of iodine, too much salt can promote high blood pressure and other problems. If your doctor tells you to cut back on your salt, you can turn to foods rich in iodine. According to Harvard Medical School, these iodine-rich foods include ocean-farmed shellfish and fish, as well as milk, eggs, cheese, yogurt and vegetables that grow in areas that contain iodine-rich soil. What Are the Functions of Iodine in the Body?